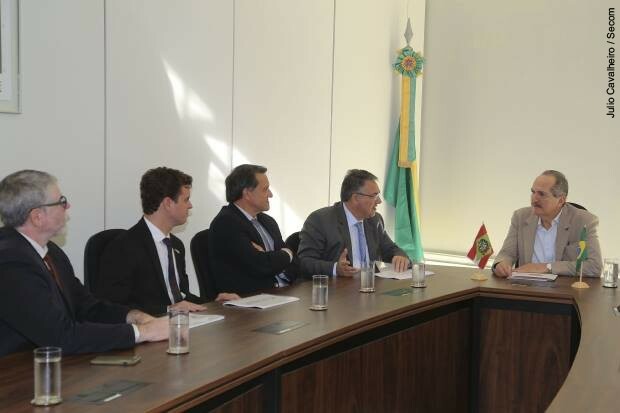 With the presence of SCPar’s President Paulo César da Costa and the Governor of SC Raimundo Colombo, NOVAER had a meeting in the Ministry of Science, Technology and Innovation and, at the time, received the support of Minister Aldo Rebelo to implement its aircraft factory in the state of Santa Catarina. According to him, the Ministry will do everything in its power to facilitate the disputes that prevent the installation of the small aircraft factory. “We will work to make these aircraft, we will find the means to do so. Brazil cannot pass up investments in this niche market”, he said. The intention of NOVAER is to commercially produce the T-Xc, a carbon fiber aircraft for two occupants in the military category and four occupants in the civil category. The prototype has already made its first flight in August 2014 and is currently being tested, to prove the estimated performance values. “We are in the final stretch to produce these aircraft in Santa Catarina. It is a phenomenal project and now we have taken another important step toward building the factory. It is a significant gain in technology to the state, which owns the best mechanical engineering course in the country”, said Colombo. The T-Xc project has support from the Federal Government, via economic support from the Financier of Studies and Projects (Finep / MCTI). In 2012, the state of Santa Catarina became a partner of the company, via its company SCPar, owning 22% of the shares. However, to follow up the next steps of the process (certification and industrialization), NOVAER waits for the clearance of the “Finep 30 days” loan, which is already approved, but requires a bank letter of warranty as collateral, which prevents it from obtaining the resource, because it is a pre-operating company.